Or the flu is here next week, or maybe last week, I don't remember exactly. Anyway, there was a thing on the news that said they could predict when an area would have the most cases of flu, or something like that. I'm afraid that a.) I didn't really believe them, and b.) didn't really get the point. Like, are we all supposed to stay home that week and no school and no work and no buying groceries so that we don't come in contact with other people? Otherwise, it doesn't seem very helpful, even if that is something that they can predict. 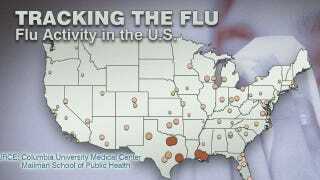 And then, if we did all stay home and not catch the flu for that week, wouldn't that mess up their map? When is the rest of the state supposed to stay home from work? I mean, we're supposed to be washing our hands and such all the time, not just when someone on the news says we'll have the most cases this week. Anyway, I am sick today. I can't tell yet if it is the flu or if it is a bad cold. I'm just terribly wimpy and don't like any of it. And I did get the shot, and I did wash my hands. I just didn't stay home and do anything silly like buy oxygen and a spacesuit. Okay, so that's it. Everybody in Texas stay home this week or whatever. Or at least stay away from me. And Walmarts. It was probably cause of Walmart.